IE is an international graduate school in Madrid, Spain. The school is dedicated to educating business leaders based on a global focus, entrepreneurial spirit, and humanistic approach. IE includes an international faculty of 600 instructors and students representing more than 90 nationalities. Over 45,000 alumni hold management positions in 100 countries. IE stresses high-quality research and multidisciplinary, integrative education programs. The school’s innovative learning processes blends online and onsite formats, making it a pioneer in international education. IE has been ranked the number one business school in Europe by both the Financial Times and BusinessWeek. IE uses Blackboard and Adobe Connect to provide its students with an online classroom environment. About half the school’s students have full-time jobs and require always-on availability, since they have a limited amount of time to spend on schoolwork. The school, which used an onsite data center, faced challenges with organizing communication and coordinating between different telecom providers. The hardware infrastructure took a long time to update, and required too many resources to maintain the system. The school also ran into problems with bandwidth, as 2,000 students used wi-fi on campus, while online students attending their classes required additional network resources. Students and faculty, in various locations worldwide, experienced problems with navigation, connectivity, and performance. IE needed fast, reliable access for all users, no matter their location. Luis Moliner, Director of Learning Technologies, says, “We try to ensure that the platform is up and running at high performance the whole day. Our students don’t have unlimited time to spend on our system—they may only have one hour a day that they can devote to their schoolwork.” To meet the challenges of a growing remote student base, IE started investigating its options. IE looked for a service that would enable easy creation of platforms, provide trustworthy service, facilitate customization, and work across its international customer base. Amazon Web Services (AWS) met all these criteria. The school started using AWS in November 2012, implementing the Adobe Connect solution in a month and Blackboard in about five months, due to provider restrictions and its complex infrastructure. IE mirrored the information between two database servers so that while one server was working, the team could install software updates or service packs on the other. IE’s AWS solution includes eight servers, including two SQL databases running in mirror mode, one Quorum, three web servers, one file server, and another server to load information from the CRM. Two more servers run real-time video conferences and handle academic and commercial activities. IE also uses AWS for part of its website. On-premises services are connected with AWS, such as application, communication between databases, computer databases, and on-premises CRM databases. 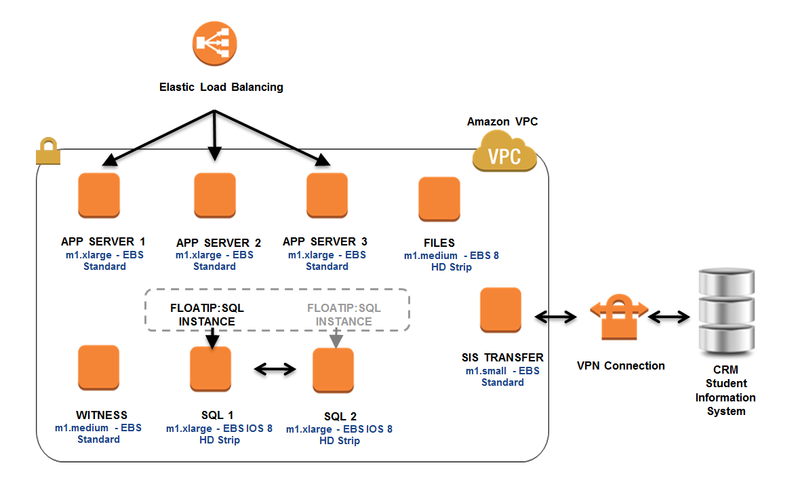 AWS services used include Amazon Route 53 to share wire domain names, RDA databases, Amazon Elastic Compute Cloud (Amazon EC2), Amazon Simple Storage Service (Amazon S3), Amazon Elastic Block Store (Amazon EBS), Amazon Virtual Private Cloud (Amazon VPC), and Elastic Load Balancing. Additional technologies include MySQL and Apache with the HP and lab service. See Figure 1 below for an illustration of IE’s architecture. By using AWS, IE has made its online services more accessible for students and faculty. Luis Moliner, Director of Learning Technologies, says, “Before we began using AWS, implementing new infrastructure took us a month—but now it just takes a couple of days.” Upgrading software has also become less time consuming; the process used to take six months, and now takes two. To learn more about how AWS can help you with your web applications, see the Web Applications details page: http://aws.amazon.com/web-mobile-social/.